Mingyur Rinpoche on Retreat September 2013. Photo Lama Tashi. The following hand-written letter was sent to us by Lama Tashi late last night (May 2nd, 2015). Though we still do not know the whereabouts of Mingyur Rinpoche or the date he will return from his retreat, we were tremendously relieved to hear that he is safe. If we receive any further news, we will pass it on as soon as possible. Though a major earthquake has struck the Himalayan region, I myself and Lama Tashi were not injured in any way and are now safe. Please do not worry about us. We were extremely worried here, but we searched for information about the situation via the internet and were relieved to learn that our siblings, families, and the members of the monastic communities are all out of harm's way. Yet we were extremely saddened to hear that many others were either killed or injured, especially in Nepal and Tibet. I wanted to send a letter as soon as the earthquake struck to let all of you know that we are safe, but I was unable to do so until now because we did not have access to the internet, so please pardon this delayed message. I am offering dedication prayers for those who passed away and making aspirations for the earthquake survivors. I encourage all my students as well to see this present situation as a lesson of impermanence (literally, "as the guru of impermanence"), to offer dedication and aspiration prayers, and to help however you can. We will all meet before long. Translated by Cortland Dahl and reviewed by Khenpo Kunga and Lama Trinley. Official translations of the new letter in other languages are coming soon. 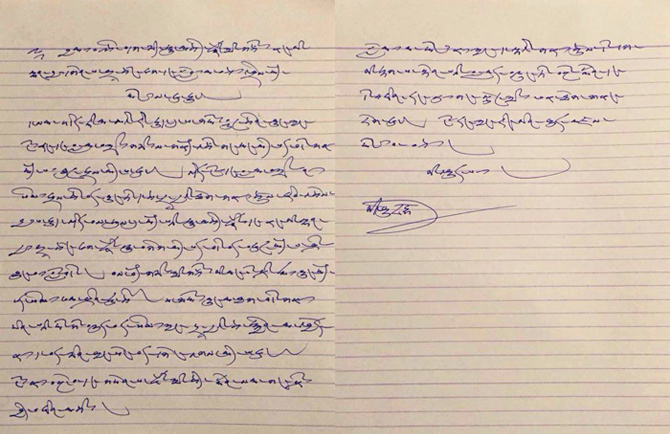 Original hand-written letter from Mingyur Rinpoche May, 2015. Photo: Lama Tashi. 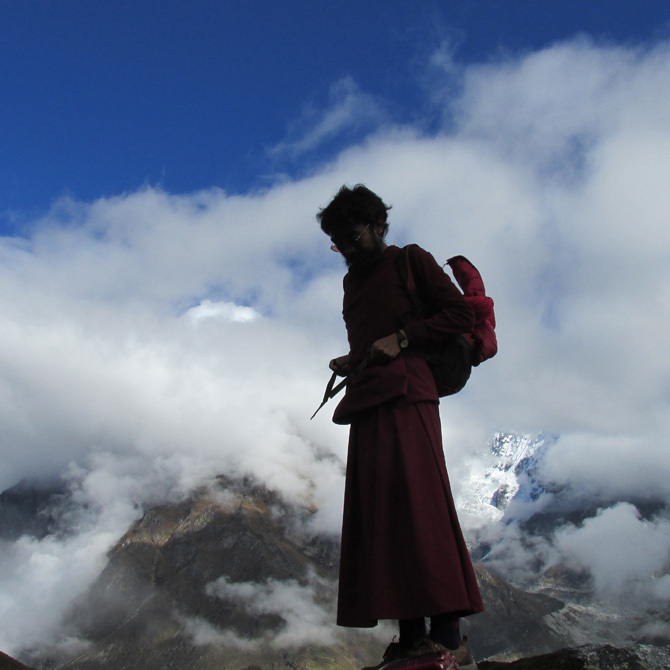 Mingyur Rinpoche hiking in the mountains September 2013. Photo Lama Tashi. Mingyur Rinpoche is currently on an extended solitary retreat in the Himalayas. In truth, no one knows exactly where he is. In the tradition of the great meditation masters of times past, he is wandering freely with no fixed plan or agenda. Throughout this period, he will likely be spending his time meditating in caves and hermitages in remote places. Meanwhile, the Tergar Meditation Community continues to thrive in his absence. Tergar lamas and instructors are holding meditation workshops and retreats around the world (including online) and there are many groups and centers that continue to follow his teachings. 6 responses on "Letter from Mingyur Rinpoche after Nepal Earthquake"
Thank you for the translation, Cortland, and to Khenpo Kunga and Lama Trinley. It’s comforting to know he wasn’t in the earthquake zone. under the huge rock. Thank goodness! very happy Rinpoche is safe! sending prayers to all affected by this tragedy. Sending prayers to all the people in Nepal and Tibet.